Before heading east for the holiday, we had a mini-Christmas with Bill’s family at his Mom’s house. There was some SERIOUSLY tasty pizza (i know pizza sounds un-festive for a family holiday celebration, but you haven’t had this pizza – I mean, DELICIOUS stuff! Just sad they’re too far from the apartment to deliver!) and a trip out to see some old fashion Christmas lights, as well as light judgement around the neighborhood. These lame lights weren’t actually in the neighborhood. They’re from here. And of course there was a whole pile of presents to dig into. Here’s the rundown on Bill’s favorite gifts this year. 1 – Router table & Router – Months. It has been MONTHS of Bill saying things like, “You know what would be awesome? A router.” And now he has one. Despite the fact that it seems there is a learning curve to it, he still can’t wait to make his first picture frame. 2 – Back scratcher – a find in the target dollar spot. Bill says it’s an imperfect replacement for me when I’m not around. But still a convenient tool. 3 – Date Night Jar – A gift I made for Bill after seeing a few around Pinterest. You’ll get to read more about it next week! 4 – Irwin Clamp Set – When he opened them, Bill went nuts. We’ve needed clamps for basically every carpentry project we’ve shared, including the bed-side cup-holder and most recently, the wooden JOY sign he made for me. These puppies will surely get a lot of use! 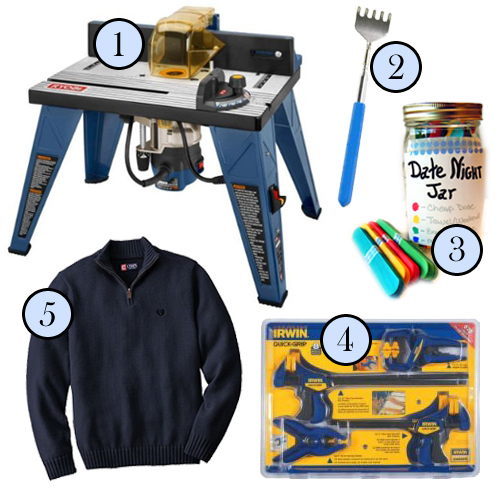 5 – Chaps Sweater – I was worried I went a little too preppy when I picked this out for him. Fortunately I was wrong, and it looks darn good over his IBM blue striped dress shirts. I’ll be sure to add a photo of him wearing it soon. So besides looking fly and having an easy reach for scratching, the rest of the loot is DIYed or made for DIYing, so we’re ready for a crafty 2013!